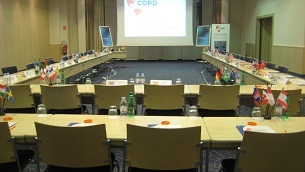 WASHINGTON, D.C. – November 2, 2015 – The 2nd COPD Global Patient Leadership Summit was held in Paris, France on October 28-30, 2015. Building on last year's summit in Madrid, Spain, this year's meeting welcomed patient representatives from additional countries – some traveling from as far as Australia, New Zealand, Singapore, China, and Canada. Dubbed the 'United Nations of COPD,’ there were a number of informative presentations outlining problems, solutions, projects, and ambitions that dealt with regional as well as global issues. The event was organized by the COPD Foundation along with input from the leadership of a number of partner organizations. COPD Foundation president and co-founder, John W. Walsh, discussed the increasing role of innovative technology in the Foundation’s research and community-building initiatives, namely the COPD Patient-Powered Research Network, COPD Crowdshaped, and COPD360social. Mr. Walsh stressed the importance of digital tools for patient advocacy and care-delivery, and described the benefits of such technologies for increased global collaboration. About COPD Global COPD Global’s mission is to establish a collaborative network of COPD related stakeholders, to promote global communication, early detection, and unified access to care for the COPD community worldwide. COPD Global is a program of the COPD Foundation.